Made by Meccano Ltd, 1998-2000. 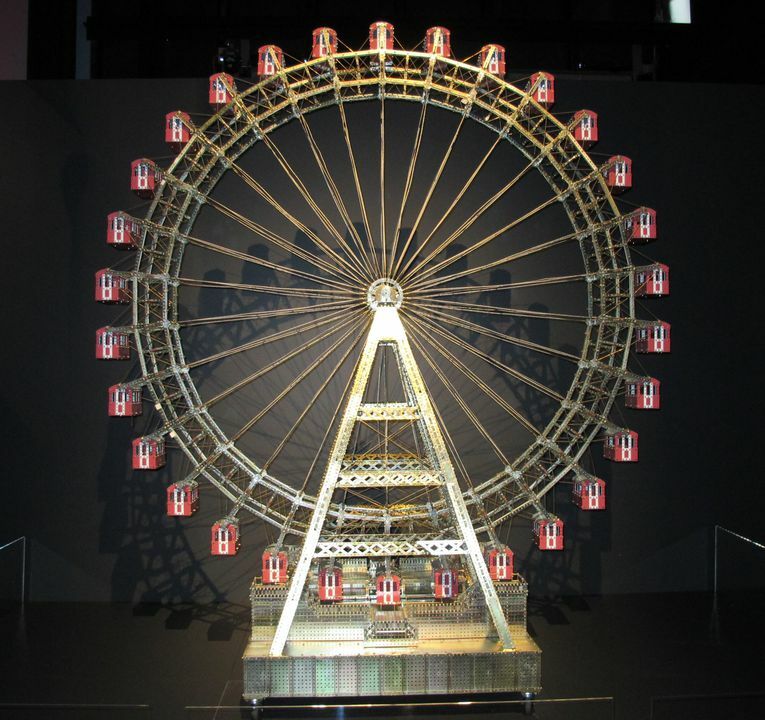 This large and imposing model of the famous 30-car ferris wheel in the Prater amusement park in Vienna, Austria, was made from Meccano and Marklin construction toy parts. The model was made in Australia by the Meccano collector and builder, Fred Lane, of Murrurundi, New South Wales. This large model stands 2.64 metres in height and comprises a large rotating wheel, 2.26 metres in diameter, with bicycle-like spokes radiating out. Suspended from the perimeter wheels are thirty cabins or gondolas. The wheel itself is supported on a triangular Meccano frame which sits on a base 1.14 metres by 1.01 metres. This ferris wheel is made up of English Meccano and German Marklin. The Marklin firm was established in 1859 by Theodor Friedrich Wilhelm Marklin (1817-1866), a master tinsmith who began making tinplate accessories for dolls' houses in the South German town of Goppingen not far from Stuttgart. After his death his widow, Caroline, ran the firm and from 1888 his sons, Eugen and Karl, founded a new company. In 1891 they bought out another toy manufacturing company with experienced staff in metal-toy construction and became Gebr. Marklin & Co. From 1919, Marklin produced its own metal construction sets like Meccano and sold it as "Marklin Metallbaukasten" to distinguish from the old name of Marklin-Meccano. The tin parts were black, the gears, nuts and bolts were made of brass, and the wheels were made of brass-plated tin. This model ferris wheel was made by Fred Lane, an avid Meccano collector and builder, from the New South Wales town of Murrurundi. Fred was born in the inner Sydney suburb of Newtown. He received Meccano as a boy and said he could "smell" the Meccano waiting for him under the tree at Christmas time. In a newspaper interview in 1998 he said "I recall waking up those Christmas mornings to the lovely aroma of Meccano parts. It used to conjure images of magic in them and it reminds you of your youth, when life was much more simple". Fred left school and worked in a factory. He became interested in wireless and went to work at the Kriesler Radio Co. which had been established in 1928 by brothers Alec, Leo and Rae Weingott, at 43 Alice Street, Newtown. During the Second World War Fred enlisted in the air force, went to wireless school and was involved in aircraft wireless maintenance and security. He returned to Kriesler which, by 1956, had become the third largest radio manufacturer in Australia. After working for Krieseler company Fred joined Amalgamated Wireless Australasia Ltd (AWA) and retired at the age of 58 as the firm's service and technical manager. Fred's Meccano collection had been in a terrace house in Sydney but when he moved to the town of Murrurundi, in northern New South Wales, after his retirement he built a brick extension to his house to store all his Meccano models. He became an avid builder and collector of Meccano and made many models including this impressive and complex ferris wheel. The museum has already acquired the famous Meccano giant blocksetting crane from Fred's collection.